The unlawful imprisonment of Brazil’s ex-President Luiz Inácio “Lula” da Silva and the speed with which his false charges were pushed through the courts show how aggressively the country’s rightwing forces are pushing back against the working classes. Shouting “Lula Livre” (“Free Lula”) is about far more than showing support for Lula’s Workers’ Party, or backing a particular candidate. 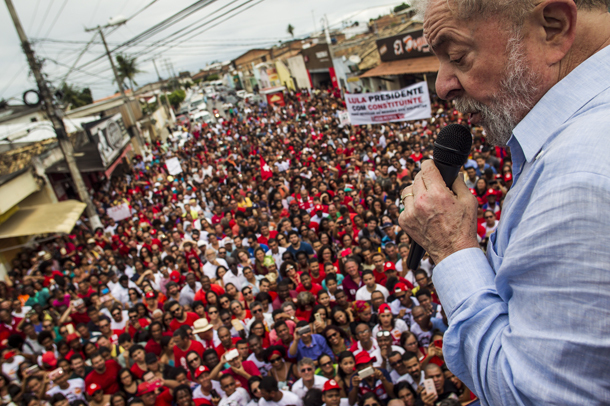 And what is at stake is a political, not a judicial, struggle; The dominant classes are desperate to prevent Lula from running in October’s presidential election in order to stall greater social equality. In this context the fight for Lula’s right to be a candidate represents the resistance of the peasants, the working classes, students, feminists, environmentalists, black and indigenous peoples to current attempts to destroy several decades of hard-won progress on Brazilian peoples’ rights and democracy. In July 2017, Federal Judge Sergio Moro sentenced Lula to nine and a half years in prison, based on false corruption and money laundering charges. Moro claimed Lula was the secret owner of a three-storey apartment allegedly given to him by OAS construction company in exchange for contracts with the state-owned oil giant Petrobras. In January 2018, a separate court increased Lula’s sentence to 12 years. Lula’s request to remain free while he appealed the conviction was denied on 4 April by the Supreme Federal Court, the highest court in Brazil. After a massive rally in front of the Metalworkers Union Office in São Bernardo, Lula handed himself in to police on 7 April. Across Brazil and the world, legal experts have condemned Lula’s incarceration as unlawful and unconstitutional. This is nothing more than a coup d'état aimed at stopping Lula, whose approval rating runs at 80% in some parts of Brazil, from once again governing the country. Lula’s imprisonment is the conclusion of the rightwing political putsch, begun in 2016 with the illegitimate ouster of President Dilma Rousseff, a Workers’ Party member elected in 2014. Dilma Rousseff was overthrown through joint parliamentary, judicial and media-based manoeuvres aimed at privatizing Brazil, handing the country over to bankers, transnational corporations and the national conservative elite, now the de facto regime’s power base supporting the illegitimate and submissive “president” Michel Temer. Temer is subservient to companies that can be rightly labelled climate criminals, such as the transnational oil giants Shell, Exxon and BP. In return for their support, Temer has granted the fossil fuel companies deepwater oil exploration rights. The current situation needs to be laid out with all clarity: what is at stake in Brazil is the people’s right to food, housing, healthcare, education, and a life without fear. Since Temer came to power, we have witnessed the reversal of loans for family farming, the removal of massive housing programs for low income families, and the withdrawal of popular Brazilian cultural revival and development programs. Transnational agribusiness and the national agrarian elites are cashing in for their interests. Public spending on education and healthcare has been frozen for 20 years through a Constitutional amendment passed by Congress and ratified by Temer. The social programs and policies for women established under the Workers’ Party tenures have been completely dismantled or undergone dramatic budget cuts, in a context of rising living costs and minimum salary reductions. The weight of expected social security repeals will also be borne by women and the working class, while private banks secure windfall deals. Because lives are now at stake in Brazil, it is essential to protect defenders, and defend the unity of the people and the leftwing forces, as well as basic civil and political rights. In February 2018 - after a Rio Carnival in which the Paraíso do Tuiuti samba school questioned whether slavery still exists in Brazil - the illegitimate Federal Government ordered the Army’s intervention in the city under the guise of tackling gang violence. But the military intervention was buying Temer time to force through murky dealings. Constitutional amendments, such as the social security repeal, cannot be voted on during a State of Emergency, and Temer’s government had not yet secured the political backing necessary for its bill to pass in Congress. On 14 March, Marielle Franco - a black, lesbian feminist and elected municipal legislator for the Socialism and Liberty Party, and one of the most militant voices against the military occupation of the favelas (shanty towns) and defender of human rights - was murdered. The day before Franco was attacked, along with her driver Anderson Pedro Gomes and advisor Fernada Chaves, who survived, Franco had denounced the Army’s ongoing abuses in the Acari community of Rio de Janeiro. No one has been arrested over the murders. On 24 January, Márcio Oliveira Matos, another Landless Workers’ Movement leader, was killed at home in the rural settlement Boa Sorte in the region of Chapada Diamantina, Bahia, where he also worked as public administrative secretary for the municipality of Itaetê. Front Line Defenders reported in their Annual Report on Human Rights Defenders at Risk in 2017 that Brazil was the deadliest country in the world for human rights defenders, with 67 activists murdered. Meanwhile, the Pastoral Land Commission, which specializes in the analysis of land rights conflicts in Brazil, said last year’s levels of violence against human rights defenders broke all records since 2003. Latin America knows by heart the assault of imperialist forces on its democratic processes. Brazil’s current struggle draws us back to the 1964 military coup, in which thousands of activists were tortured, disappeared and murdered, and leftwing political parties were forced underground. Shortly before the Supreme Federal Court’s decision on Lula’s submission to remain free during his appeal, Army Commander-in-Chief Eduardo Villas-Boas clearly intended to intimidate the court when he tweeted that the military “rejects impunity” and demands “respect for the Constitution, social peace and democracy”. We are witnessing the revival of the colonialism and racism that subdued our Indigenous peoples and African-descended population with slavery, expropriation and genocide. The male chauvinist movement in Congress that shouted “Goodbye, dear!” as Dilma was ousted, only to be replaced with an entirely male cabinet, is seeking to deny our historical and hard-won conquests and deprive us of political space. Nevertheless, social movements in Brazil are fighting harder than ever for a more participatory democracy. We have taken responsibility for our role as agents of change and are building unity in the struggle for sovereignty. In this way, we are all Marielle, Marcio, Lula – the defenders of the commons, territories and democracy who are attacked, persecuted and killed. Crying “Free Lula” today represents the fight for system change and the acceptance of one’s self as part of this historical responsibility.